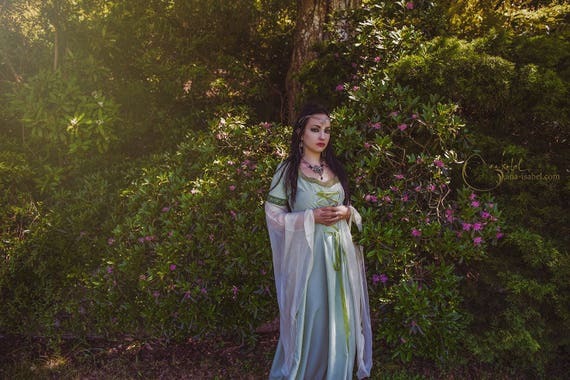 Under the guise of Superstitchious, Zarah makes customised gothic clothing with a twist of medieval fantasy. Her most famous clients are the black metal band Hecate Enthroned. What inspired you to get into costume? My path into costume design stemmed naturally from my interest in sewing and customising things, as well as my love of illustration (which I studied as my degree). What sort of style do you make and why? My designs are mainly Medieval dresses and Gothic and Victorian garments for men and women. My fascination with historical costume, and fantasy costume from film and television inspires me hugely, and I combine this with an of the moment Gothic aesthetic to create my own unique styles. I’m being inspired and creating new pieces all the time. The cogs in my mind turn regularly, envisaging new ideas to be made reality. I’ve just made a new Viking style dress which is quite different from my other dresses but is to be used in a photoshoot. Keep an eye on my Etsy page! I have lots of different designs which are permanent features in my shop, so it’s really hard to choose! 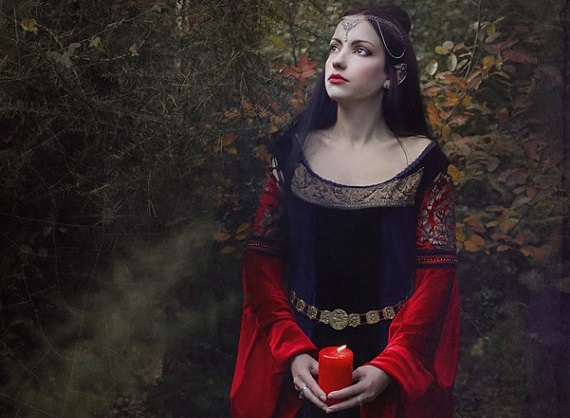 But I do have my personal favourites, one of which would have to be my Forest Dress because it’s a deep dark blood red velvet – my favourite colour! In regards to custom creations outside of my regular shop listings, I really enjoyed creating stage pieces for the band Hecate Enthroned. Working with input from the band to design and make items that they envisaged wearing on stage was an absolute pleasure and so much fun! Forest Dress – more colours available! What have you found challenging about getting into costume? I’m mostly self taught with a bit of training from short sewing courses. So I had to practice and learn a lot of the special techniques and finishes needed for making professional and high quality items to sell. Can you see it as a viable career? At the moment it’s my career for half the week with a part time job thrown in the other days. So I’m halfway there! In the last few years it’s taken off and grown to the stage where I’m getting regular orders, so I do treat it as a career. The Lord of the Rings trilogy, Gormenghast, M R James, everything by Susan Hill, fairytale and folklore, horror authors like James Herbert and Stephen King, Brian Frouds faery books, Beowulf, Hans Christian Andersen, Alice in Wonderland, Helen Cresswell, Robert Westall, John Masefield, anything by Maurice Sendak..
What makes you stand out amongst so many designers of the same kind of look? All of the materials that I use for my clothes are of the highest quality, that I’ve spent time sourcing, and I continue to use time and time again. My customers are paying for quality items, and the fact that everything is lovingly custom made to fit any size, I think is appealing to them. I really love it when people ask me to create something specific that they imagine, and with their ideas I can make it a reality. I love the challenge of thinking outside of my own regular designs, or adapting them and changing things around to create something unique for the wearer.